Gov. 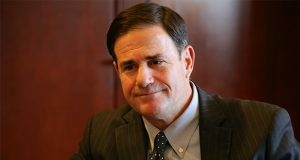 Doug Ducey signed off on Tempe’s “dark money” ballot initiative, a move that will likely open up the state to a lawsuit. The Attorney General’s Office wants the Arizona Supreme Court to weigh in on whether property tax incentives in lease agreements that the City of Tempe signed with several developers violate state law. Arizona cities are losing their right to demand that nonprofit groups seeking to sway local elections divulge who is financing the effort. On a 33-25 margin the Republican-controlled House voted to prohibit local government from requiring organizations declared to be tax-exempt by the Internal Revenue Service from registering as political action committees, even if they are putting money into races. Rep. Vince Leach has followed through on a threat to ask the Attorney General’s Office to investigate whether Tempe broke the law in signing two lease agreements with developers he alleges received illegal tax breaks. A Tucson Republican is threatening to sic the Attorney General’s Office on Tempe if the city doesn’t update two lease agreements with developers he alleges received illegal tax breaks. Tempe Municipal Court Judge Thomas Robinson continued to receive his $155,000 salary after he admitted to stabbing his wife 10 times. Sen. Warren Petersen, R-Gilbert, has filed a complaint with the Attorney General’s Office and asked if the City of Bisbee’s ban on single-use plastic bags violates state laws.